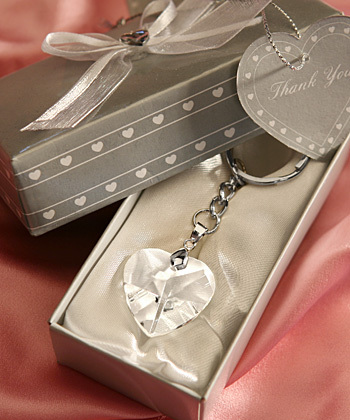 Dangle this romantic heart keychain in front of guests, as an unforgettable favor. Highlighted by Choice Crystal by Fashioncraft. A "key" ingredient to your wedding or shower should be these lovely 3.75 x 1 x 0.5 chrome keychain favors. The 3-dimensional crystal heart pendant is a timeless reminder of your wedding celebration. Perfectly packaged in a silver deluxe 4.5 x 2 x 1.125 box that is accented with a heart design, organza bow and attached heart-shaped thank you tag.